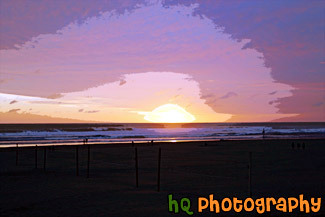 A beautiful sunset picture taken along the coast at Seaside, Oregon. In this picture you can see volleyball nets in the sand and some people walking along the shore enjoying this spectacular sunset. Seaside is a popular tourists destination in Oregon.